Blinky Bill is a little koala with a big imagination. He lives in little town of Green Patch with his mom and dad and has lots of friends. Being adventurer at heart same as his dad, Blinky Bill dreams of leaving his little town and following in his missing father. Mr. Bill went missing in the Outback some time ago and Blinky is the only one who believes his father is still alive. Leaving native town is not very easy as Blinky has to leave his mom and friends. But he watch to see his dad back, and he assumes that Mr. Bill is in danger and needs help. While Blinky's dad is away, the small town is danger as mischievous reptile wants to take over and control the town. It even put the Statue of Lizarty to show that reptiles now control the town. Everyone wants Mr.Bill back. When Blinky discovers a mysterious marker that hints at his dad’s whereabouts, he embarks on a journey that takes him beyond the boundary of Green Patch and into the wild and dangerous Outback. He quickly makes friends with Nutsy, a zoo koala, and Jacko, a nervous frill-necked lizard. Pursued relentlessly by a vengeful cat who has a personal score to settle with Blinky, the trio must learn to work together if they ever want to survive the rugged Australian landscape and find Blinky’s father. Blinky Bill is brave, smart and adventurous little koala, who loves making new friends, always ready to help and the most important find the find a way out of any difficult situation when seems nothing can be done. We watched the movie with Teddy and he liked it so much. Blinky Bill has lots of interesting turnarounds, plus you feel that you are in Australia: nature, animals and landscape. Both Blinky and his dad loves adventures. Mr. Bill thought many things to Blinky so that he can survive himself and help others. And the most important lesson little koala learned is never give up, that's why Blinky finally found his dad. 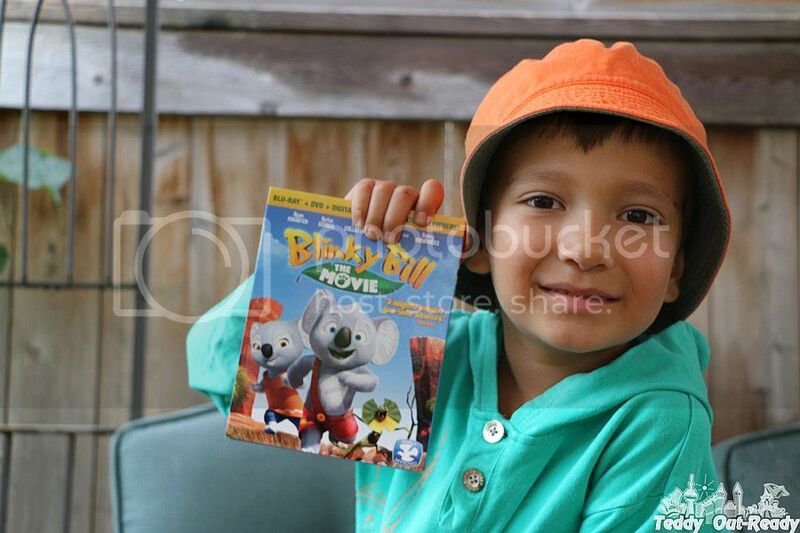 In the movie Teddy likes Blinky's dad, may be because he knows many things about how to do various things. Adventures of the world-famous Australian koala Blinky Bill is now available in new release Blinky Bill: The Movie. It is out on Blu-ray, DVD and all major Digital platforms this month from Shout! Factory Kids. Lovely animated movie for the whole family to watch. I can't wait to see this one with the grandkids ! That's a beautiful movie for kids! I'd love to pay for my research paper and spend time with my kid watching this movie rather than working again all night.